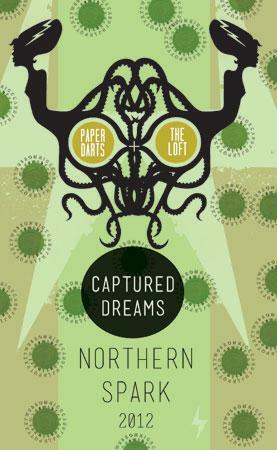 Paper Darts and the Loft invite you to forget for one playful night what makes dreams unreal. Ignore your friends who complain when you talk about your dreams, and instead revel in the notion that the world at large wants to read about the fantastic things deep inside that mysterious head of yours. Over the course of the night, a selected group of poets, storytellers, and performers will recite works from the field of dreams―both private and practical, both their own and the creations of others―to help participants prep their minds for a trip to the astral plane. Readers will follow some of the common thematic threads that weave together our universal dreamscape: recurring, fantasy, nightmares, and the surreal. to be what we dreamt of being. The reading and dreaming space of the Loft at Open Book’s transformed Target Performance Hall will be stocked with blank tablets ready to be filled with your Kafkaesque experiences and anecdotal advice for navigating the nonphysical realms visited during sleep. Loft staff will offer writing prompts, ideas, and dream interpretation stations to help decode your subconscious. Take a micronap and use the dream interpretation stations to help divine where your dreams will take you. Write it down as a poem, story, lyrics, or essay and submit it to Paper Darts before you leave. and you can make it up as you go. One of the Loft’s classrooms will be converted into a darkened viewing room, where a film comprised of recorded dream stories (submitted by participants before the event) will be combined into one joyous, fearful, and exquisite loop of odd storytelling. This film will play throughout the entire night. Make of its stories what you wish: clues to the collective unconscious? prophetic revelations? souls’ portals into another realm? And memory can shake them off with ease. Paper Darts will set up a workstation in the commons at the Loft. This area will be committed to translating your dream writing into one cohesive magazine that captures the events of the evening in its pages. Once your dream-themed compositions are complete and you are ready to return to the mundane physical world, your stories, poems, essays, and tidbits may be submitted for copyediting and inclusion in this one-of-a-kind publication, which will be available for purchase via print on demand at the conclusion of Northern Spark.